All natural ingredients ,no toxic solvents ,no harmful petrochemicals that can too often cause serious health issues, no nasty skin rashes, helps eliminate dermatitis. * REMOVES: Bugs & Tar,Silicons, Paint,Ink, ,Grease ,Fat, Oil,Dirt, and lots more applications. * Just one sheet is usually enough. 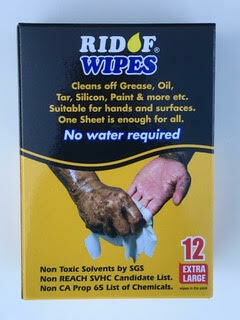 Hundreds of Other Applications ,BBQ,Appliances,Car Interior & Exterior,Allow Wheels Nothing Cleans like "RIDOF"